"The Battle in the Teutoburg Forest", signed: Fritz, March 20, 1813, Breslau. Drawing by Crown Prince Friedrich Wilhelm of Prussia. An ambush ( also called a surprise attack) is a long-established military tactic. It is a surprise attack from a hidden position against an enemy. The enemy may be moving or they may have stopped. Ambush uses the element of surprise to confuse the enemy soldiers long enough to be successful. The point of an ambush is not to gain territory. Instead it may be used to harass an enemy. It may also be used to capture or destroy key assets (people, equipment, supplies, etc.). 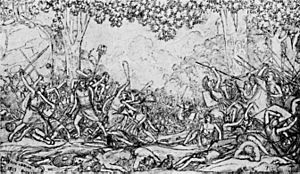 One of the earliest recorded use of the ambush was in 9 AD in the Battle of the Teutoburg Forest. A Germanic leader Arminius ambushed three Roman legions under the command of Varus. The 20,000 Roman soldiers were strung out in a long line of march through the densely wooded forest. They fought for days but in the end the Romans were completely destroyed. This was not just a military victory, it was a psychological victory over the Romans. Ambush Facts for Kids. Kiddle Encyclopedia.